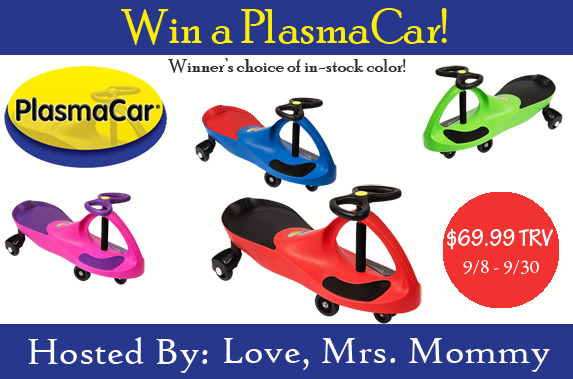 The plasmaCar is quite the fun toy. See it in ACTION! Do you know anyone who owns one? What was your favorite toy as a child? Share with me below and enter to win! 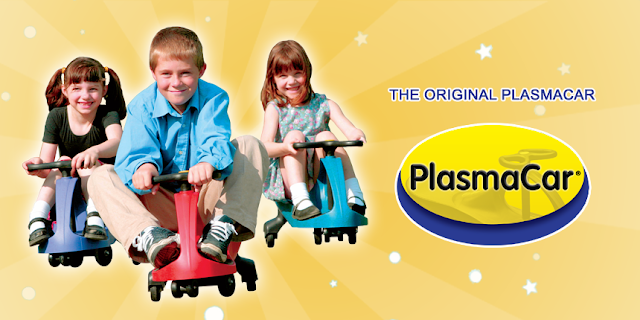 PlasmaCar is a ride-on toy that uses the natural forces of inertia, centrifugal force, friction and of course all that power your child has stored inside. I really appreciate that you don't need any batteries to operate this car. You also don't have to mess around with gears or pedals. Your child can sit back on their patented safety seat and enjoy their fun ride! You can use this indoors or outdoors, but it's best (no matter where you use it), to be on a flat surface. Great for ages 3+ and up to 220 lbs! That's right, if mom and dad want to give it a go, no worries! I know I did!! These are fun. We had one years ago that was missing a piece and they wouldn't replace it without charging me and I was stubborn. Now we have a new one and it's so fun, I wish I'd have just paid the small fee for the replacement part before! !